More great photographs from my friends in New Zealand. Circa 1978, riding out to a Pennington Balfour race in Elsdon. Andrew Meo (red cap, blue jacket), David Meo (yellow cap), David Barnett (white cap, red/white jacket), Allan Tindale (pale blue cap and jacket), Mike Podmore (white cap, yellow jacket), Trevor Rice (black cap, behind David Barnett), Richard Walters (red cap, at the back). Mike Podmore (aka Pugwash) travelled to Belgium, but was tragically killed riding to his first race by a drunk driver, all the PNP boys raced a Pennington Balfour race with black arm bands in his honor. 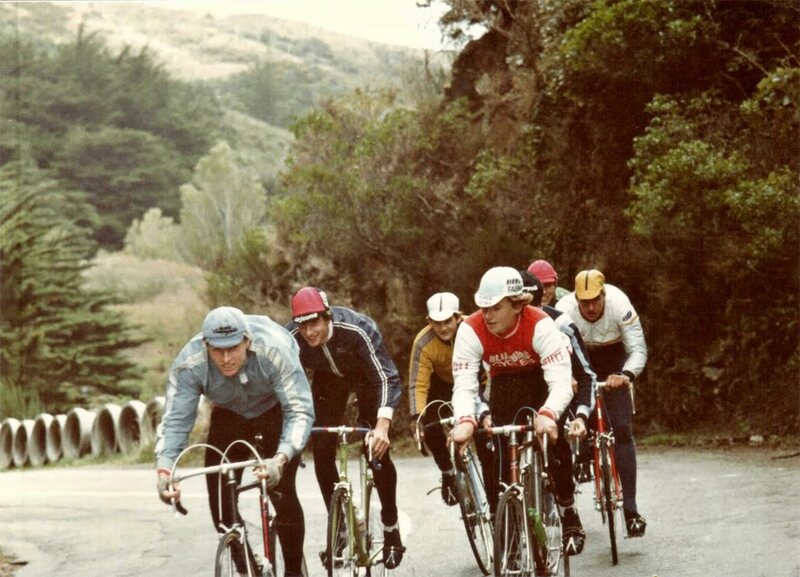 « Picture of the day……… Everyday cycling heros !